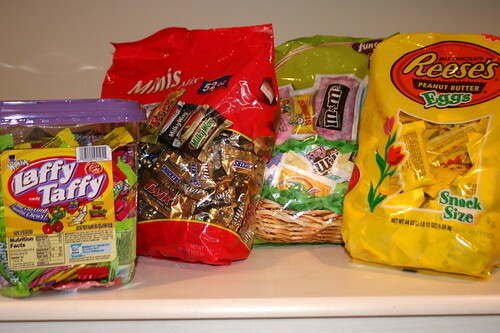 I my opinion, and probably the rest of my family's opinion, you can never get enough sweets. After a morning of unproductive house hunting, Mickey and I stopped at Sam's for a few things. (Kade went home with a friend from school. Thanks so much, Amy.) We got the things we needed and then remembered we are sponsoring an Easter egg hunt on Sunday in honor of Kade's birthday. We had to get some candy to fill about 10 dozen eggs. This is what we got. I just hope it lasts until Sunday afternoon. What's the address of this egg hunt? It wouldn't be a candy stash for Mickey if there weren't Laffy Taffys, right?